Fixed Asset Depreciation is asset depreciation software designed especially for Certified Public Accountants and small businesses. 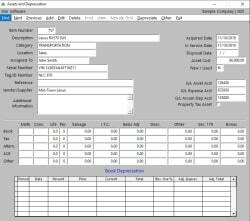 Our Fixed Asset Depreciation software has been designed by C.P.A. 's for use by C.P.A.’s and small to medium sized businesses. We offer both a single client version for entering depreciation for one company and a multiple client version if you have more than one company needing asset depreciation. Each of these versions can be purchased for a single user or for multiple users. Our depreciation software supports straight-line, MACRS, ACRS, declining balance, double declining balance, sum-of-the-years-digits, declining balance switching to straight-line, amortization, and non-depreciating asset	methods. 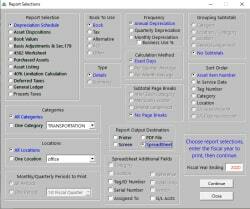 The fundamental principles were to design Fixed Asset Depreciation software that was very easy to operate, provide for all allowable tax table depreciation methods and many additional specialized depreciation methods, yet remain flexible enough to allow for adjusting depreciation to match prior reported depreciation. One of the main features of our depreciation software is the actual depreciation of assets. This is done one time for each book and the asset never has to be edited again unless either the business use for a particular year falls below 100% or you dispose of an asset. Any years depreciation schedule is available on demand, therefore, any time consuming "annual recalculations or year closings" are eliminated. Print prior years depreciation schedules at any time by just entering the year to print. Our fixed asset depreciation software has been in use by C.P.A. 's and small businesses since 1991. Our reports have been laid out by accounting professionals to provide all pertinent information in an easy to read, usable format. Our Asset Information and Depreciation report is one of the most informative reports available and is not available in other fixed asset depreciation software. Our depreciation software includes the latest tax revisions regarding the Bonus depreciation deductions and new Section 179 limits. You can now select "Round" to have all depreciation amounts rounded to the closest dollar amount. If your asset information can be provided in an acceptable csv or spreadsheet format, we will do the asset setup and depreciation for you. We reserve the right to limit the number of companies we will set up for those purchasing the multiple client version. We do not charge for this service for our customers. No prior depreciation - normal method of depreciating an asset. This will depreciate the asset for every year of its useful life. Our recommended method of entry. Automatic - the depreciation of an asset is automatically calculated for all years based on the method, convention, and life selected. 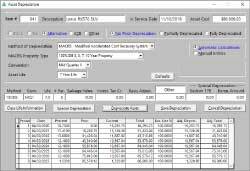 This method uses the depreciation tables as provided by the I.R.S. Manual - same as automatic except that each years percent or depreciation amount can be manually overridden during entry. This allows for an easy adjustment to make your depreciation balance with prior years schedules.